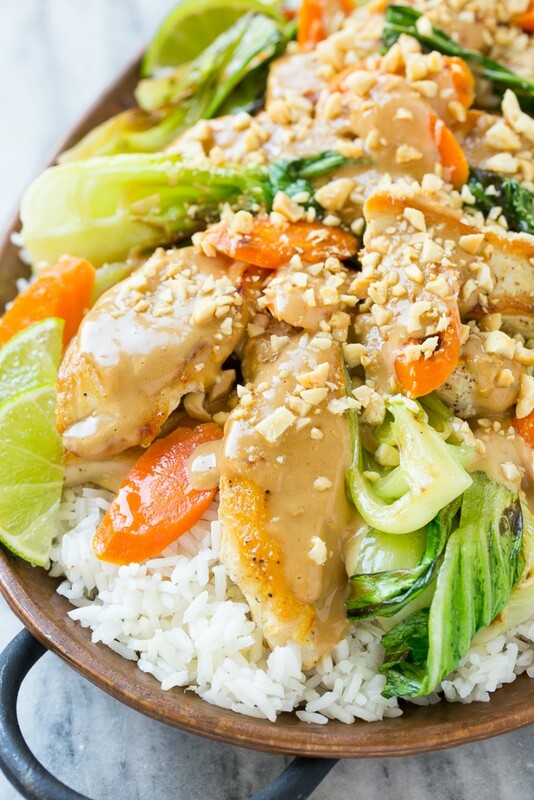 This recipe for Thai peanut chicken is a quick and easy stir fry with seared chicken and colorful vegetables, all covered in a homemade peanut sauce. Serve it with a side of rice for a complete meal that’s ready in less than 30 minutes! When I get a hankering for Thai food, I whip up my favorite homemade versions including Thai cucumber salad, peanut noodles and this fabulous peanut chicken. I absolutely love Thai food but I’ve found that sometimes it can be hard to replicate the same flavors at home. Many Thai dishes call for ingredients like kaffir lime leaves, fish sauce, galangal and lemon grass which can be difficult to find at the grocery store. 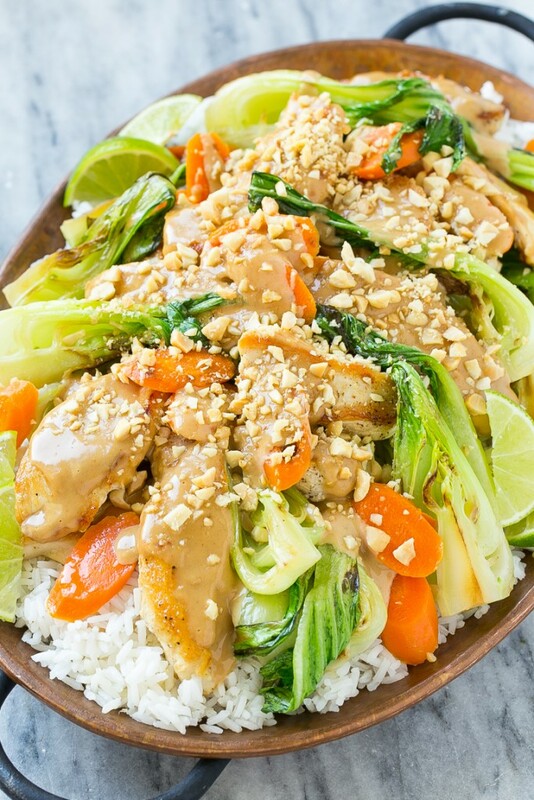 This Thai peanut chicken tastes like something you’d get at a restaurant but it doesn’t require any specialty ingredients! How do you make Thai peanut chicken? 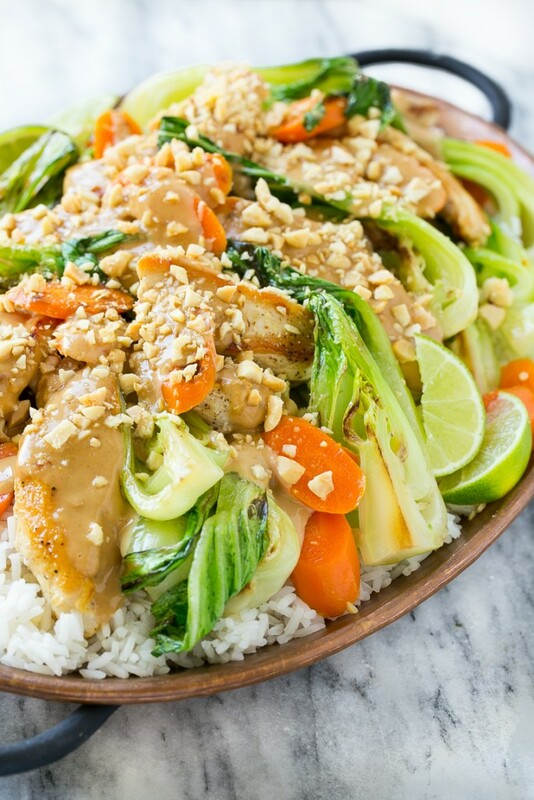 The base for this Thai peanut chicken is super simple – it’s just seared chicken breast strips and vegetables. I used baby bok choy and carrots but you can absolutely change that up, other great options would be broccoli, bell peppers, zucchini or even eggplant. While your chicken and veggies are cooking, you can whip up the peanut sauce in the food processor in just a few minutes. I kept this peanut sauce on the mild side because I was feeding kids, but definitely up the amount of red pepper flakes if you prefer more heat. After the chicken and veggies are cooked, pour the peanut sauce over the top, add some chopped peanuts and dinner is served! I put up a pot of rice at the same time as I start cooking the chicken to complete the meal. You can use chicken breast pieces, chicken thighs or even other proteins such as shrimp or beef in this dish. The peanut sauce can be made up to 3 days before you plan to serve it. Looking to cut carbs? Serve your peanut chicken over cauliflower rice. 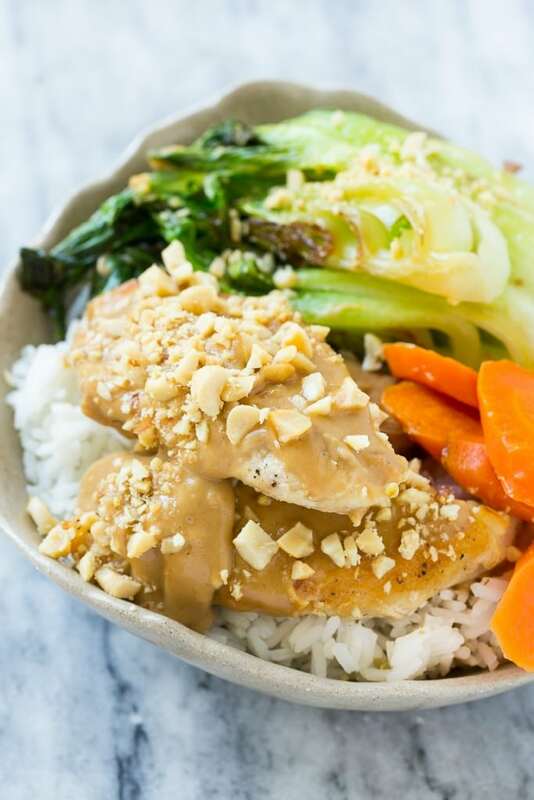 This Thai peanut chicken is a great way to make your own Thai take out without having to make a trip to a specialty store. And it’s also ready in 30 minutes, doesn’t get much better than that! 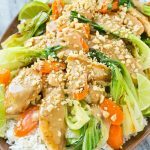 This recipe for Thai peanut chicken is a quick and easy stir fry with seared chicken and colorful vegetables, all tossed in a homemade peanut sauce. Serve it with a side of rice for a complete meal that's ready in less than 30 minutes! Heat 1 teaspoon of oil in a pan over medium high heat. Add the carrots and cook for 1-2 minutes. Add 2 tablespoons of water and cook, stirring occasionally, for 4-6 minutes until the water has cooked off and carrots have started to soften. While the chicken is cooking, make the peanut sauce. Place the ginger, garlic, peanut butter, lime juice, brown sugar, soy sauce, red pepper flakes and 2 tablespoons of water in a food processor; blend until smooth. Add more water to further thin the sauce if desired. I’m going to try making this but am wondering if fresh ginger and fresh garlic can be subbed with the jarred minced ginger and garlic? Thank you in advance! The pictures are amazing! I want that dish! This looks so fresh and flavorful. I do believe you and I were in the same line when taste buds were passed out. And I love that you don’t need any fancy, hard-to-find ingredients. Beautiful Thai dish and love the sauce! This looks delicious! I also love the carrots and bok Choy! Oh this is a personal favorite of mine! 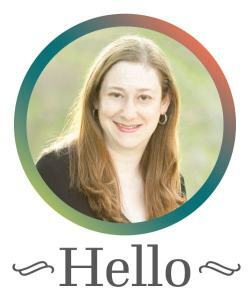 Love the peanuts and bok choy and ginger – you cook all the things I want to eat! Your photos are outstanding. Thanks for sharing this delicious recipe! I have the same trouble with replicating my favorite Thai flavors, this is a great recipe to have around when you crave Thai but can’t get to a specialty store!